Factory vs. Custom Borescope Video--you will be amazed! Precision single-point, cut-rifled barrels, from .20 to .338 caliber, plus .50 Cal, starting at $245. Wide variety of contours, very exact twist rates. Benchmark built its reputation with record-setting rimfire barrels, and now they are producing excellent centerfire barrels as well. Contact Ron Sinema or Barry Graber at (360) 652-2594 or email info [at] benchmark-barrels.com. Location: Benchmark Barrels, 1105 Pioneer Highway East, Arlington, WA 98223. Traditional Obermeyer-style "5R" cut-rifled barrels made in Scotland. Long barrel life, high quality. Distributed by O.K. Weber in the USA. Brux produces very high-quality cut-rifled barrels. Recent records have been set with Brux 6mm and 6.5mm barrels, and the 7mms have performed well in F-Class applications. Brux is located in Lodi, Wisconsin. Call (608) 592-3324. Conventional and canted land (5C) pull-buttoned barrels. Stress-relieved and meticulously hand-lapped, Broughton barrels clean easily and the 5C offers enhanced velocities. Broughton Canted Land Barrels. High grade push-button, hand-lapped barrels. Long, effective barrel life. Along with Shilen, Hart barrels have dominated 100/200yd BR for decades. Great choice for 6mm BR varmint guns too. Excellent hand-lapped buttoned barrels that have been winning matches, particularly in 30BR IBS competition. Cut-rifled barrels with very long barrel life. Top smiths say Krieger barrels are almost always straight and true. Fewer duds than some other brands. Hard to go wrong with a Krieger. Barney Lawton's barrels have been quite successful in long-range BR matches. 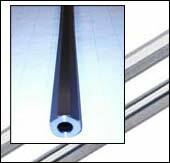 Lawton Machine, LLC offers both cut-rifled and pull-buttoned barrels in 6mm through .408 bore sizes. Hand-lapped button rifled barrels. Lilja's 3-groove 6BR barrels are very accurate and clean fast. Lilja's rim fire barrels are among the very best. Barrel-maker and chamberer. Conventional barrels plus pre-fit, three-groove, and polygonal rifling. Hand-lapped, pull-buttoned barrels with superb accuracy. Conventional and 5-land Polygon (P5) rifling options. Good prices ($254/blank). David Tubb uses Gary Schneider's barrels exclusively. Enough said. Big-name Texas barrel-maker still produces the lion's share of winning short-range BR barrels. They now offer ratchet (canted land) as well as conventional push-button rifling in 3, 4, 5 and 6 grooves. Accurate, button-rifled barrels available completely chambered in a wide variety of calibers. Tight control of tolerances. Considerable success in big-bore 1000yd guns and accuracy-guaranteed Varmint guns. Good value and excellent customer service. Buttoned barrels from proprietary super high-grade German steel. Polygonal rifling available in .223 and .30 calibers. Good value on prechambered and threaded barrels. Finished barrels for the M 98, Savage and CZ rifles. 54 standard contours and 1500 other contours are available. HEF USA offers the patented Melonite process for barrels and bolts bodies. This provides a thin (10-20 micron) layer of surface hardening. This produces a very slick, very hard surface that provides reduced friction in the bore. Early tests show Melonite barrel treatment can reduce throat wear and increase useful barrel life. Copyright 2010, AccurateShooter.com | 6mmBR.com, All Rights Reserved. No reproduction without advanced permission in writing.